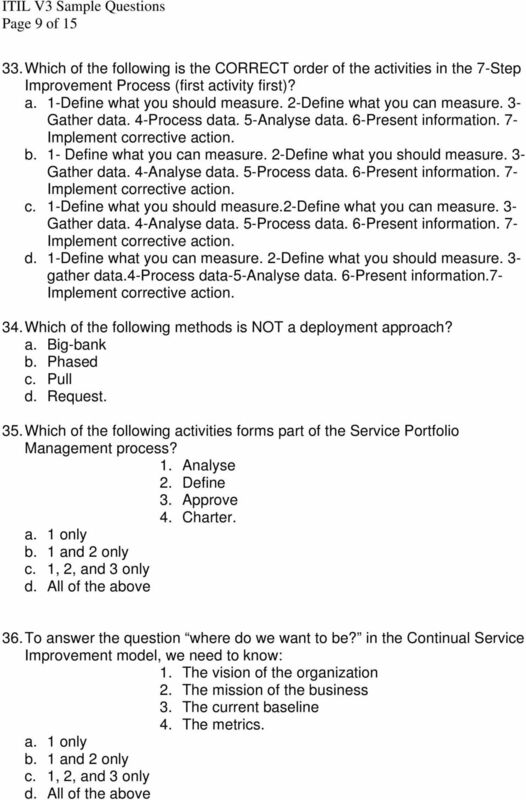 Download "ITIL V3 Sample Questions Page 1 of 15 Sample ITIL version 3 Foundation Examination. Instructions"
1 Page 1 of 15 Sample ITIL version 3 Foundation Examination Instructions 40 questions should be attempted. There are no trick questions. You have 60 minutes to complete this paper. Candidates sitting the examination in a language other than their native language have a maximum of 75 minutes and are allowed the use of a dictionary. 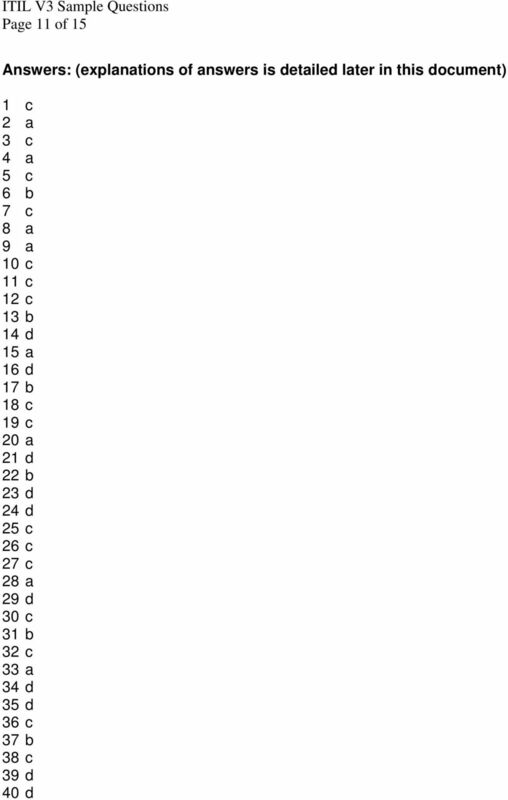 Your must answer 26 or more questions correctly to pass. Questions 1. Which of the following statements BEST describes one of the purposes of Service Analytics? a. Service Analytics is a means for automating simple and routine tasks and interactions. b. Service Analytics is useful to restore normal Service Operation as quickly as possible in case of an incident. c. Service Analytics is useful to model existing components and services to the higher-level business services. d. Service Analytics is a means to ensure proper funding for the delivery and consumption of services. 2. The goal of Problem Management is: a. to prevent Problems and resulting Incidents from happening b. to provide a channel for users to request standard services c. to restore normal Service Operation as quickly as possible d. to detect Events, make sense of them, and determine the appropriate control action. 3. Which of the following statements BEST describes the role of the Service Desk as the single point of contact? a. All requests, such as Incident, Service Requests and service Level Requirements from users and customers must pass through the Service Desk. b. To provide a single point of contact to the users, an organization can only have one centralized Service Desk. c. As a user I have one single point of contact for all my Incidents and Service Requests but others users in the organization may have other points of contact. d. The Service Desk is on offer for the users in an organization. But they are of course allowed to contact anybody within the IT organization with their Incidents and Service Requests. 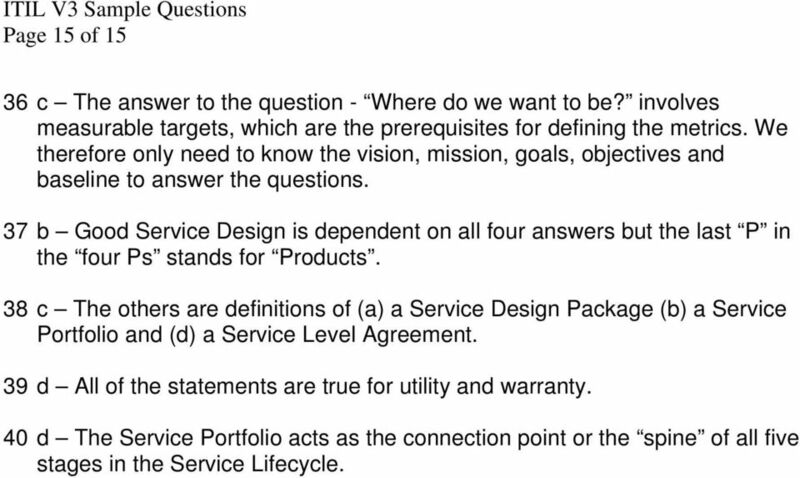 3 Page 3 of Which of the following validation activities BEST corresponds to the definition of customer and business requirements (level 1 in the Service V-model? a. Validate Service Packages, offerings and contracts b. Service operational readiness test c. Service Release Package test d. Components and assembly test. 9. Which of the following statements BEST describes the difference between an Operational Level Agreement and an Underpinning Contract? a. Only the Operational Level Agreement is an underpinning agreement between an IT Service Provider and another part of the same organizations that assists with the provision of services. b. Only the Operational Level Agreement defines the goods or services to be provided and the responsibilities of both parties. c. Only the Underpinning Contract defines targets and responsibilities that are required to meet agreed Service Level Targets in a service Level Agreement. d. Only the Underpinning Contract supports the IT Service Provider s delivery of IT services to customers 10. Which of the following goals are the primary goals for Service Operations? 1. To allow for changes and improvements. 2. To design processes for the operation of IT services. 3. To achieve effectiveness and efficiency in the delivery and support of services. 4. To maintain stability. a. 3 only b. 3 and 4 only c. 1, 3, and 4 only 11. Which of the following is the CORRECT definition of Service Management? a. Service Management is a set of specialized organizational resources for providing value to customers in the form of services. b. Service Management is a set of specialized organizational resources for providing value to customers in the form of goods and products. c. Service Management is a set of specialized organizational capabilities for providing value to customer sin the form of services. d. Service Management is a set of specialized organizational capabilities for providing value to the Service Provider in the form of goods and products. 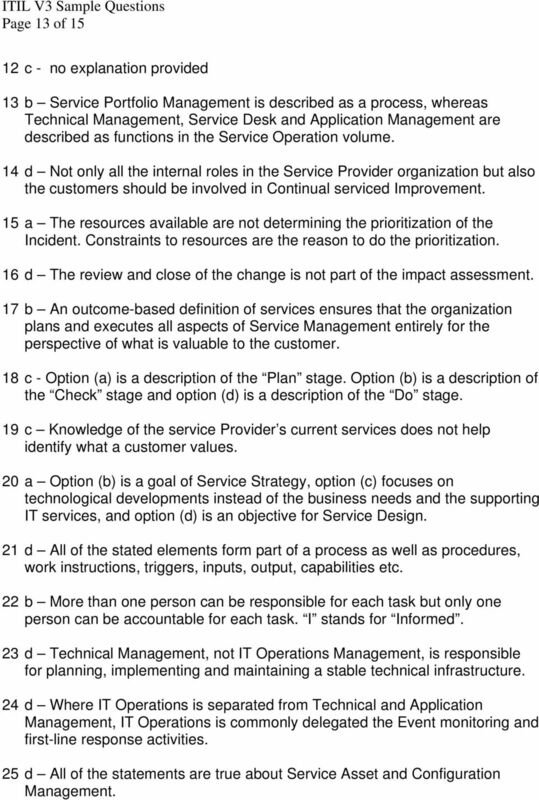 6 Page 6 of The goal of Continual Service Improvement is BEST described as: a. To continually align and re-align IT services to the changing business needs by identifying and implementing improvements to IT services that support business processes b. To encourage Service Providers to stop and think why something is to be done before thinking how c. To continually identify and implement d. To design services that satisfy business objectives. 21. Which of the following are generic elements of a process? 1. Process Activities 2. Process policy 3. Process roles 4. Process metrics. b. 1 and 3 only c. 1, 3 and 4 only 22. Which of the following statements are CORRECT regarding the RACI authority matrix? 1. The R in RACI stands for responsible. 2. The RACI chart shows the activities down the lefthand side and the functional roles across the top. 3. More than one person can be accountable for each takes. 4. The I in RACI stands for initiator. c. 1, 2 and 3 only 23. Which of the following is NOT an activity that IT Operations Management is responsible for? a. Console management b. Management of facilities c. Output management d. Maintenance of a stable technical infrastructure. 24. Assume that IT Operations is separated from Technical and Application Management. Which of the following roles does Technical an Application Management normally NOT play in the Event Management process? a. Participating in the instrumentation of the services. b. Testing the services to ensure that Events are properly generated. c. Ensuring that any auto responses are defined. d. Monitoring Events. 12 Page 12 of 15 Detailed explanation of correct answers: 1 c Option (a) is an objective for Event Management (b) is an objective for Incident Management and (d) is an objective for Financial Management 2 a Option (b) is a goal for Request Fulfillment, (c) is a goal for Incident Management and (d) is a goal of Event Management 3 c Single point of contact is seen from the user s perspective. Option (a) is incorrect because customer requests such as Service Level Requirements normally go to a Business Relationship Manager, A Service Level Manager or similar. Option (b) is incorrect because different users can contact different Service Desks as long as each user has only one single contact point. Option (d) is incorrect because single point of contact is also means to ensure that all user requests are logged and tracked by a dedicated function. 4 a - (statement 2 is correct) 1) is not true as Only the person responsible for the process as a whole is the Process Owner; 3) the Process Owner and Process Manager (i.e. Incident Manager) can be the same person, but is not always the same person (therefore the 3 statement is not correct); and 4) Process Ownership is always a role but is not necessarily implemented as a function in the organization. 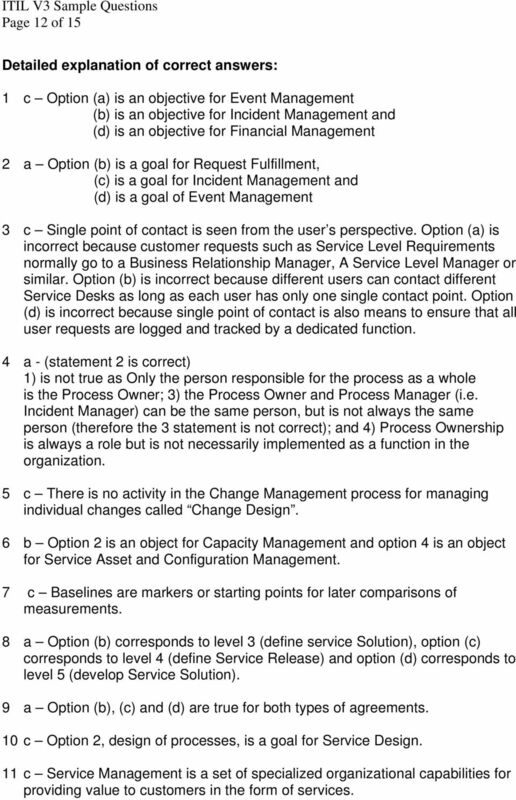 5 c There is no activity in the Change Management process for managing individual changes called Change Design. 6 b Option 2 is an object for Capacity Management and option 4 is an object for Service Asset and Configuration Management. 7 c Baselines are markers or starting points for later comparisons of measurements. 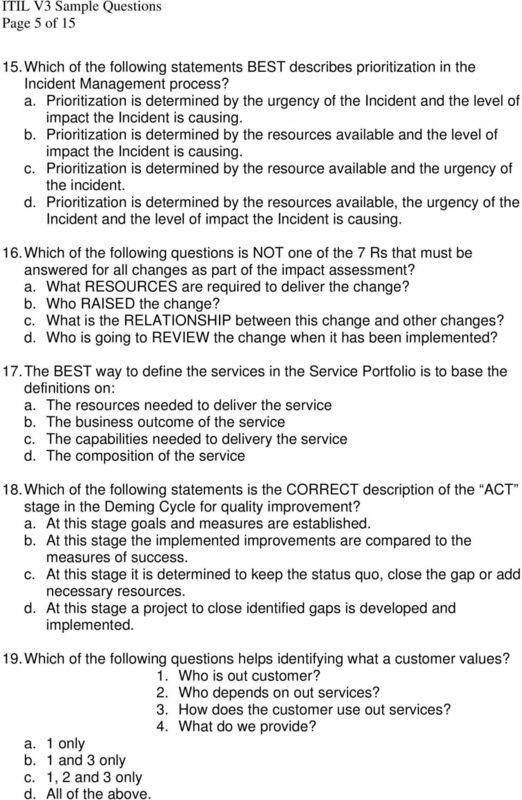 8 a Option (b) corresponds to level 3 (define service Solution), option (c) corresponds to level 4 (define Service Release) and option (d) corresponds to level 5 (develop Service Solution). 9 a Option (b), (c) and (d) are true for both types of agreements. 10 c Option 2, design of processes, is a goal for Service Design. 11 c Service Management is a set of specialized organizational capabilities for providing value to customers in the form of services. 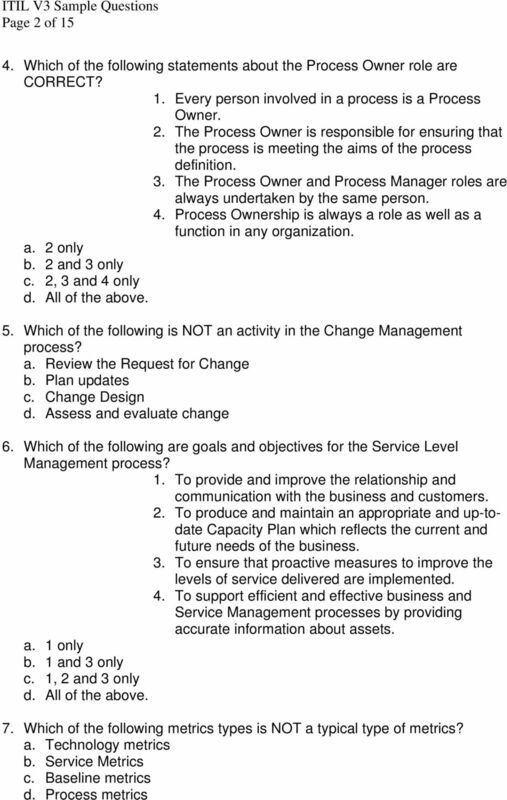 13 Page 13 of c - no explanation provided 13 b Service Portfolio Management is described as a process, whereas Technical Management, Service Desk and Application Management are described as functions in the Service Operation volume. 14 d Not only all the internal roles in the Service Provider organization but also the customers should be involved in Continual serviced Improvement. 15 a The resources available are not determining the prioritization of the Incident. Constraints to resources are the reason to do the prioritization. 16 d The review and close of the change is not part of the impact assessment. 17 b An outcome-based definition of services ensures that the organization plans and executes all aspects of Service Management entirely for the perspective of what is valuable to the customer. 18 c - Option (a) is a description of the Plan stage. Option (b) is a description of the Check stage and option (d) is a description of the Do stage. 19 c Knowledge of the service Provider s current services does not help identify what a customer values. 20 a Option (b) is a goal of Service Strategy, option (c) focuses on technological developments instead of the business needs and the supporting IT services, and option (d) is an objective for Service Design. 21 d All of the stated elements form part of a process as well as procedures, work instructions, triggers, inputs, output, capabilities etc. 22 b More than one person can be responsible for each task but only one person can be accountable for each task. I stands for Informed. 23 d Technical Management, not IT Operations Management, is responsible for planning, implementing and maintaining a stable technical infrastructure. 24 d Where IT Operations is separated from Technical and Application Management, IT Operations is commonly delegated the Event monitoring and first-line response activities. 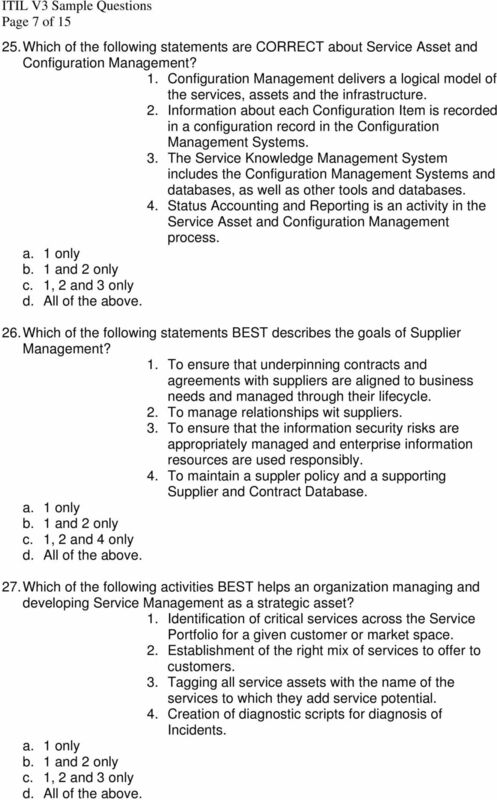 25 d All of the statements are true about Service Asset and Configuration Management. 14 Page 14 of c Even though it is important to manage information security risks for data and services managed by third parties (option 3), this is a responsibility for the Information Security Management process. 27 c Options 1, 2, and 3 are all part of the activities involved in developing Service Management as a strategic asset within the Service Strategy Management process. Option 4 improves the Service Management processes but not necessarily as a strategic asset. 28 a The other options are counterparts of stability, cost and reactive behaviour, respectively. 29 d The Service Design Package should be produced during the design stage for new, changed and removed services. A Service design package is normally only produced for major changes. 30 c An increased rate of success of changes and releases is first and foremost a result of good Service Transition practices. The (a) total cost of ownership is reduced as a result of well-designed services, processes and technology, (b) more effective processes are a result of processes designed with optimal quality and cost effectiveness and (d) improved quality and consistency of service are the result of services designed within the corporate strategy, architecture and constraints. 31 b ITIL is an example of good practice. (a) ISO/IEC20000 provides a formal standard for organizations seeking to have their Service Management Capabilities audited and certified, (c) the IT Service Management certifications and diplomas owned by OGC and managed by APGM form an example of a qualification scheme and (d) there are good examples of academic research supporting and/or criticizing ITL but ITIL itself is not academic research. 32 c Defining the process strategy is a responsibility of the Process Owner, whereas the service Owner is responsible for the three other activities. 33 a not additional explanation is provided 34 d A deployment method called Request does not exist in ITIL. Option (a) is where the new or changed service is deployed to all user areas in one operation, (b) is where the service is deployed to a part of the user base initially and this operation is repeated for subsequent parts of the user based, and (c) is here the software is available in a central location but users are free to download the software at a time of their choosing. 35 d All of the activities are port of the Service Portfolio Management process. 15 Page 15 of c The answer to the question - Where do we want to be? involves measurable targets, which are the prerequisites for defining the metrics. We therefore only need to know the vision, mission, goals, objectives and baseline to answer the questions. 37 b Good Service Design is dependent on all four answers but the last P in the four Ps stands for Products. 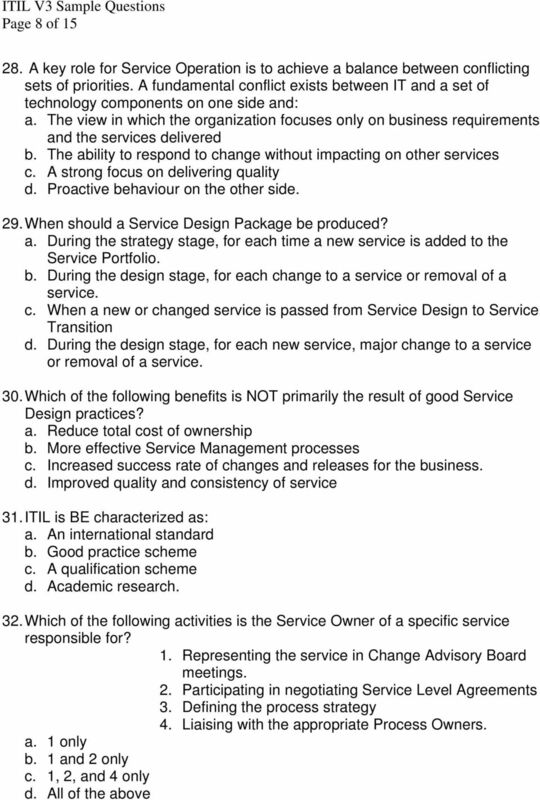 38 c The others are definitions of (a) a Service Design Package (b) a Service Portfolio and (d) a Service Level Agreement. 39 d All of the statements are true for utility and warranty. 40 d The Service Portfolio acts as the connection point or the spine of all five stages in the Service Lifecycle. 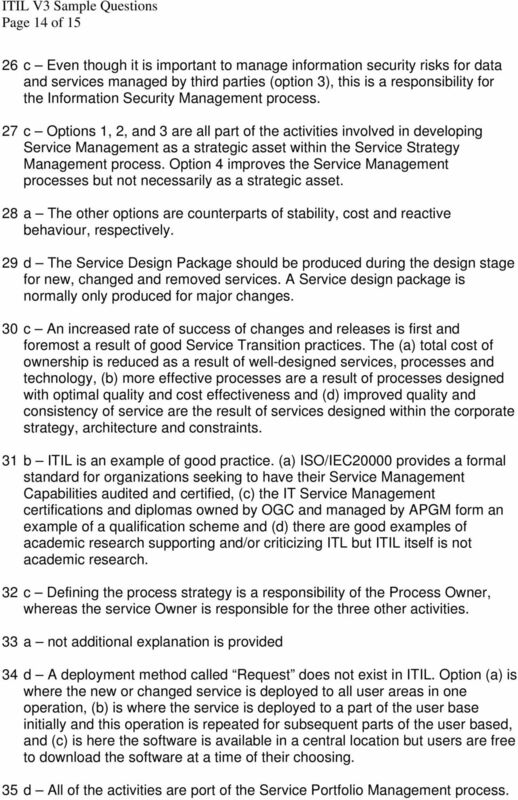 The ITIL v.3. 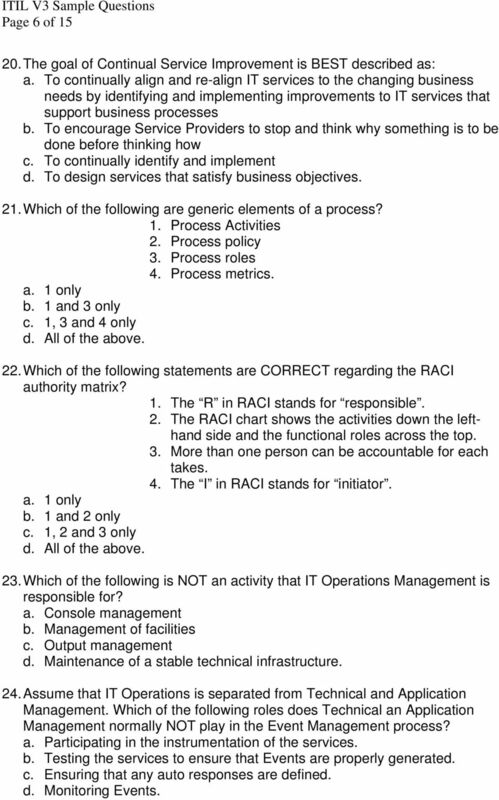 Foundation Examination ITIL v. 3 Foundation Examination: Sample Paper 3, version 3.0 Multiple Choice Instructions 1. All 40 questions should be attempted. 2. There are no trick questions. The ITIL v.3 Foundation Examination ITIL v. 3 Foundation Examination: Sample Paper B, version 3.1 Multiple Choice Instructions 1. All 40 questions should be attempted. 2. There are no trick questions. IS Management, ITIL, ISO, COBIT... Orsys, with 30 years of experience, is providing high quality, independant State of the Art seminars and hands-on courses corresponding to the needs of IT professionals. 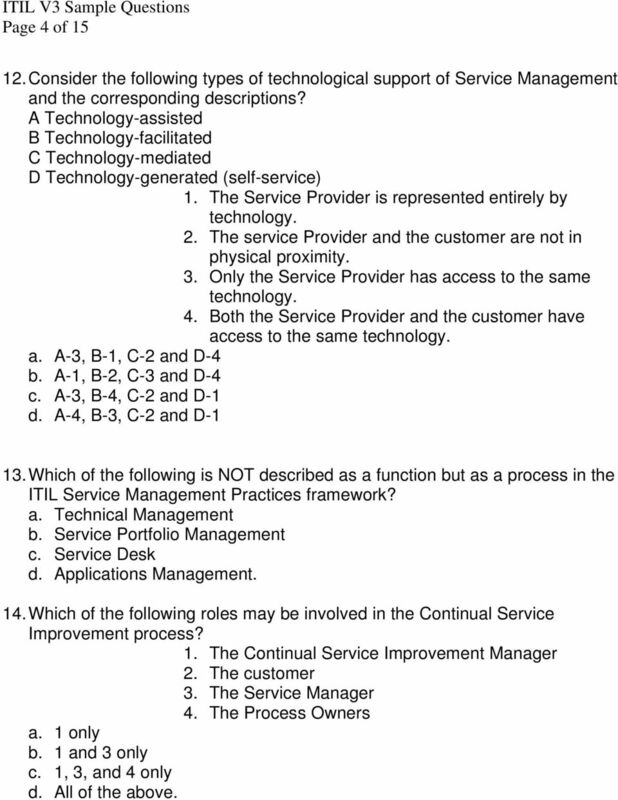 Exam : ITIL Title : ITIL Foundation v.3 Version : Demo 1 / 5 1.Which of the following is NOT an example of Self-Help capabilities? A. Requirement to always call the service desk for service requests B.
PinkLINK July 2008. Pink Elephant. All rights reserved. Page 1 of 5 Learn more about ITIL by visiting: www.pinkelephant.com.